As the 2017 edition of the Major League Baseball postseason begins, we see good reason to expect the Cleveland Indians end their 69-year-old World Series Championship drought. The Tribe enter the playoffs as 3:1 favorites according to my model, besting the Dodgers (18%) who were torrid much of the year and the Astros (16%) who led the American League much of the season. That said, neither the Indians, nor the Dodgers nor the Astros will be playing again until later this week; there are two more urgent contests yet to be held. The New York Yankees host the Minnesota Twins for the American League Wild Card tomorrow night. The Arizona Diamondbacks host the Colorado Rockies on Wednesday. In both cases the home team is favored: New York by 63% and Arizona by 59%. The most likely discrete World Series outcome remains the same as it was during my last ratings post: Indians over Dodgers in five games. 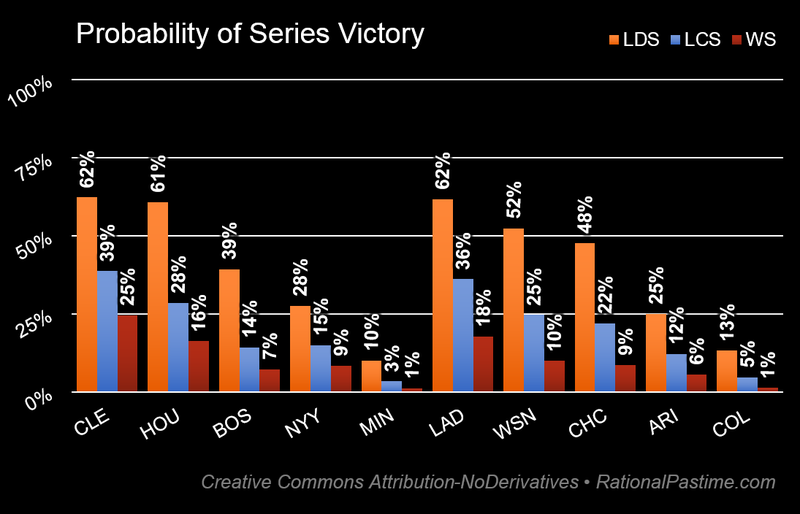 Stay tuned for updated probabilities and additional coverage as the playoffs continue.